Ted Kleinhans qualified as a veteran in three stages of his long life. He pitched professionally for 14 seasons (1928-1941), saw US Army service in both World Wars, and spent 20 years as head baseball coach at Syracuse University (1947-1966). The left-hander debuted as a professional in the Middle Atlantic League, and went on to play portions of four seasons with a trio of major-league teams, including the 1936 world champion New York Yankees. His lifetime big-league record totaled just four wins and nine losses; his minor-league numbers totals were 163 victories and 122 defeats. Traugott Otto Kleinhans (his birth name was later changed to Theodore Otto) was born on April 8, 1899, in Deer Park, Wisconsin, a village in the northwestern part of the state. The son of Paul O. and Amanda Henke Kleinhans, he was the second of four siblings, the others being Gerhard, Erich, and Margaret. Paul Kleinhans was the son of German immigrants, August and Fredricka Kleinhans, and followed his father into the Lutheran ministry. In 1901 Paul was called to pastor the Bethlehem Lutheran Church in Cleveland, Ohio, where he remained for five decades. He enjoyed baseball and encouraged his southpaw son’s participation in the sport, as well as giving him guidance toward a career in the ministry. Young Kleinhans enrolled as a theology student at Concordia College in Fort Wayne, Indiana, but interrupted his studies in May 1917 to enlist in the Ohio National Guard. Called to active duty, he saw action with the 145th Infantry Regiment in France, where he was wounded in the Meuse-Argonne campaign. Kleinhans mustered out of the service as a sergeant in May 1919. Returning to Cleveland, Kleinhans married a local resident, Edna Brozio, and the couple produced two sons, Paul and Theodore. He worked as a clerk and in sales, and continued to develop his pitching repertoire in the area’s semipro leagues. His moving fastball, palmball change-up, and breaking ball attracted the attention of Cleveland scout Frank Novario, who persuaded the 29-year-old southpaw to sign with the Indians. Kleinhans was farmed out to the Johnstown Johnnies of the Class C Middle Atlantic League in 1928, and due to his late start as a pro, listed his age as 24. He turned in a 4-6 record, working 83 innings in 13 games, with a 3.69 earned-run average. The following year he twirled for two teams in the Middle Atlantic League (Johnstown and Cumberland), worked 199 innings in 48 games and went 13-8. In 1930 Kleinhans moved up to the Class B Three-I League, and went 14-15 in 37 games with Terre Haute and Bloomington. The 6-foot 170-pounder recorded a combined record of eight wins and five losses in three leagues in 1931: Danville (Three-I), Columbus (American Association), and Greensboro (Piedmont). Kleinhans logged the best season of his career in 1932 with Greensboro in the Class B Piedmont League, posting 21 wins against eight losses and leading the league in strikeouts (226) and walks (144). The second-place Patriots won the playoffs over first-place Charlotte. Another lefty on the Greensboro staff with 21 victories was Fritz Ostermueller, who went on to a 15-year major-league career. Greensboro was under the control of the Cardinals, and in 1933 St. Louis sold Kleinhans to Atlanta of the Southern Association. The Cracker uniform was a good fit; Ted worked 279 innings in 42 contests, with a won-lost mark of 19-13, and 21 complete games, and was named to the league’s all-star team. After the season, Kleinhans was sold to the Chicago Cubs, who quickly packaged him with two other players and cash to acquire slugger Chuck Klein from the Philadelphia Phillies. Twelve days after his 35th birthday, Kleinhans made his major-league debut with Philadelphia on April 20, 1934. With Brooklyn leading 2-0, he relieved in the bottom of the eighth and surrendered three earned runs on three hits, including a two-run homer by Len Koenecke. After four more unimpressive outings out of the bullpen, Kleinhans was traded on May 16 with outfielders Art Ruble and Wes Schulmerich to Cincinnati for pitcher Sylvester Johnson and outfielder Johnny Moore. 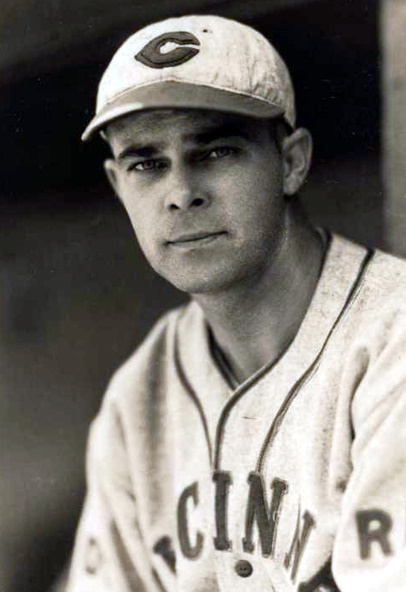 Kleinhans made his first appearance with Cincinnati on May 27 at Brooklyn; he worked two innings and allowed a pair of runs on four hits in a 5-0 Dodgers victory. Six days later, on June 2, he started at home against Chicago and recorded his initial big-league victory, 3-1. He worked into the seventh inning, allowing one run on seven hits, and was 1-for-2 at the plate, scoring a run and batting in another, both major-league firsts for the right-handed batter. The rookie faced the Pirates in his next start, scattering seven hits in eight innings, but suffered his first loss, 2-1. Kleinhans started seven other contests during the season, without a victory. He notched a relief win, 6-4, over Pittsburgh on July 21, working 5? scoreless innings at Crosley Field. His season record of two wins and six losses mirrored that of the Cincinnati team; the Reds finished in the cellar, 42 games behind the champion Cardinals. On January 8, 1935, Cincinnati sold Kleinhans to Newark of the International League. He paced the Bears mound staff with 17 wins against eight losses, and led the league with six shutouts. His fine season resulted in his sale to the New York Yankees, Newark’s parent club. St. Petersburg, Florida, was abuzz in the spring of 1936, with heralded rookie outfielder Joe DiMaggio joining the powerful lineup of Gehrig, Lazzeri, Crosetti, Rolfe, Dickey, Selkirk, et al. As for Kleinhans, he was competing for a roster spot on a deep staff of hurlers that included Red Ruffing, Monte Pearson, Lefty Gomez, John Broaca, Bump Hadley, Pat Malone, and Johnny Murphy. Kleinhans made the Opening Day roster and preserved a 10-6 victory for starter Red Ruffing over Washington at Yankee Stadium on April 23, working 3? scoreless innings. On May 7 he received credit for his only win as a Yankee, pitching a scoreless ninth inning in a 6-5 triumph over Detroit. Two weeks later in Detroit Kleinhans coughed up the winning run in the home half of the ninth, and tasted defeat, 10-9. Relegated to a mop-up role, Kleinhans had few opportunities as New York continued its cruise through the opposition; in mid-August the southpaw was swapped back to Newark for another hurler, Kemp Wicker. Returned to the International League, Kleinhans posted a 4-2 mark in eight appearances. Meanwhile, the Yankees captured the flag with 102 wins and a 19½-game margin over Detroit, and vanquished the New York Giants, four games to two, in the World Series. Yankee players voted a full winner’s share to Kleinhans, whose 19-game contribution was one win, one loss, and one save. Kleinhans started against the Dodgers on September 14, gave up six runs, and was charged with the 11-2 loss. A week later he recorded a 6-3 triumph over the Phillies, hurling 7? innings. He saw relief duty in four more outings before getting a start on October 3 in the first game of a season-ending doubleheader at Pittsburgh and losing, 4-3. Kleinhans’ late-season tally with the last-place Reds was one win, two losses, and a 2.30 ERA. Kleinhans made it out of spring training with the Reds in 1938, but after a one-inning relief stint in a 10-4 blowout loss to the Cubs on April 20, was sold outright to Syracuse of the International League. In four major-league seasons, he pitched 143? innings in 56 games, with 12 starts, four wins, nine losses, one save, and a 5.26 ERA. After leaving baseball Kleinhans worked in the circulation department of the Syracuse Herald-Journal, and became a district manager. He also took classes at Syracuse University in pursuit of a degree in physical education. In addition, he kept his left arm limber, pitching with the Homer Merchants in the New York Amateur Baseball League. With the outbreak of World War II, Kleinhans was eager to serve his country. An Army unit, the 52nd General Hospital, was being formed in alliance with Syracuse University’s College of Medicine, and he applied. He was accepted, and after training at bases in Louisiana and New Jersey, was commissioned a captain in medical administration. The unit went overseas in January 1943, first to Scotland, then to a permanent location in Worcestershire, England. Over its existence it treated more than 21,000 patients. Captain Kleinhans augmented administrative duties with an occasional performance with its baseball team. On June 17, 1945, a pair of Army baseball teams, the Grays and Whites, played in London in a Red Cross benefit game before an estimated crowd of 12,000. The 46-year-old Kleinhans captained the Grays and led them to a 7-5 victory, hurling the first five innings and allowing four hits and three runs. Captain Kleinhans was discharged at Fort Dix, New Jersey, on December 28, 1945, and returned to Syracuse University to complete his degree. In May 1946 he married Thelma Curley, a teacher in the Syracuse public schools and at Syracuse University extension. (The marriage to Edna Brosio had been dissolved.) Kleinhans was named acting coach of the Syracuse University baseball squad as 1947 approached, filling the vacancy created when Forest Evashevski left Syracuse to coach football at Michigan State. After earning his sheepskin in June 1947, Kleinhans became the official head coach. In 1966 Kleinhans retired from coaching with a 20-year record of 156-146. The most successful team was the 1961 club (17-5). The Orangemen earned a spot in the College World Series in Omaha that year, and with wins over Northern Colorado and Western Michigan, made it to the semifinals where they were ousted by Oklahoma State. Two future major leaguers were on the ’61 team: hurler Dave Giusti and pitcher-infielder Bill Connors. Giusti credited Coach Kleinhans with teaching him the palmball, a pitch he called his “out pitch” in a 15-year big-league career. In 1967 Ted and Thelma Kleinhans moved from Syracuse to Redington Beach, Florida. Their Gulf Coast home provided a dock for berthing their cabin cruiser, also utilized as a guest house. Ted fished, played golf, and continued to follow baseball; Redington Beach was in close proximity to several Grapefruit League spring-training sites. After a long illness, Theodore Otto Kleinhans, at age 86, died in Redington Beach on July 24, 1985. He was survived by Thelma and his two sons from his first marriage. He was buried at Serenity Gardens Memorial Park in Largo, Florida. In preparing this biography the author relied on clippings from the Kleinhans file at the Baseball Hall of Fame and records from SABR founding member Ray Nemec. Also helpful were Encyclopedia of Minor League Baseball, 3rd edition; Total Baseball, 2nd edition; Baseball-Reference.com; Retrosheet.org; Ancestry.com; and GenealogyBank.com.